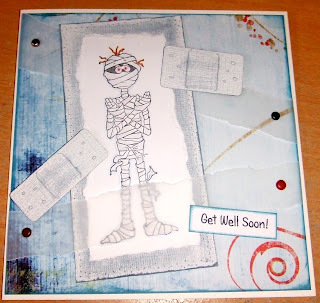 Blue Daisy Designs: Distressed Mummy! Thought this would be good as a get well card - in the right circumstances obviously, and only if the person had a good sense of humour!! The stamp is from Art Gone Wild - Johnny. Papers are Co'redinations Whitewash and Dreamstreet Nostalgic. I used a Heidi Swapp Edge Distresser, an Xcut Distressing Tool and a very sharp felting needle. The bandages are sizzlits.